Roz wants to dance with you! This is a workshop for beginner needle felters. Needle felt a face, with eye sockets, and felted nose. Needle felt pawpads and foot pads. Paint with acrylic paint and shading with pencils. Double neck joint, and movable ankles and wrists. Roz has a rather unusual pattern design and multiple joints (ten articulated points instead of the usual five). This makes her extra posable and fun to play with. She is made from batik dyed mohair, and the felting details are added with merino wool. The pattern for her felt dress and instructions to make it is included. 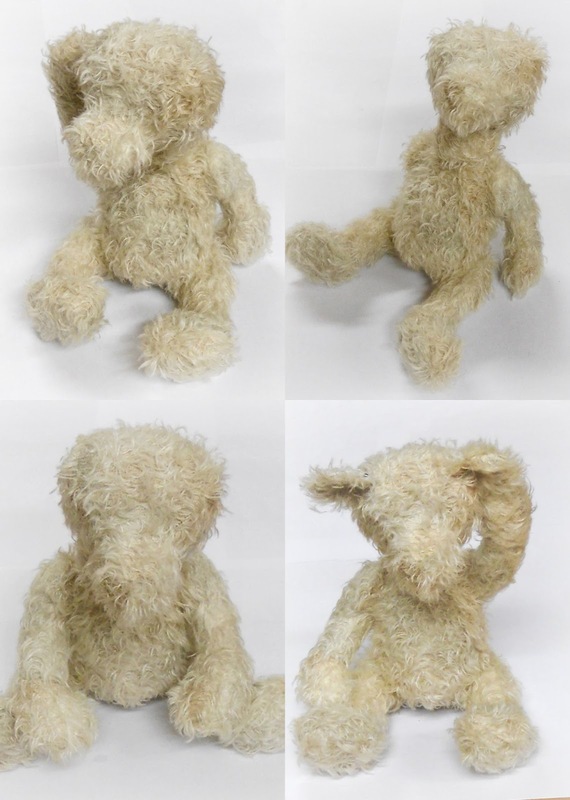 To participate in the workshop, you will need some skill as a teddy bear maker, basic bear making techniques are not covered in the workshop. Here are a few photos I took while making the bear. It will give you a little hint about how much entertainment you are letting yourself in for when making Roz. First, get the bear together, and play with poses using all those joints. 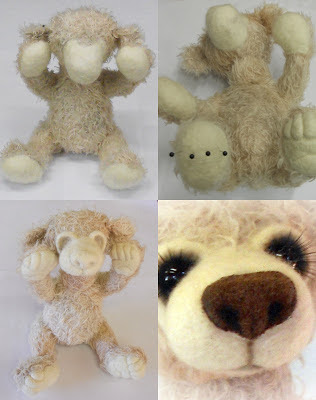 Then add the needle felt details, and some paint and eyelashes to make her beautiful. Finally, raid your stash for some funky felt colours and matching buttons, and make a simple-to-sew dress. 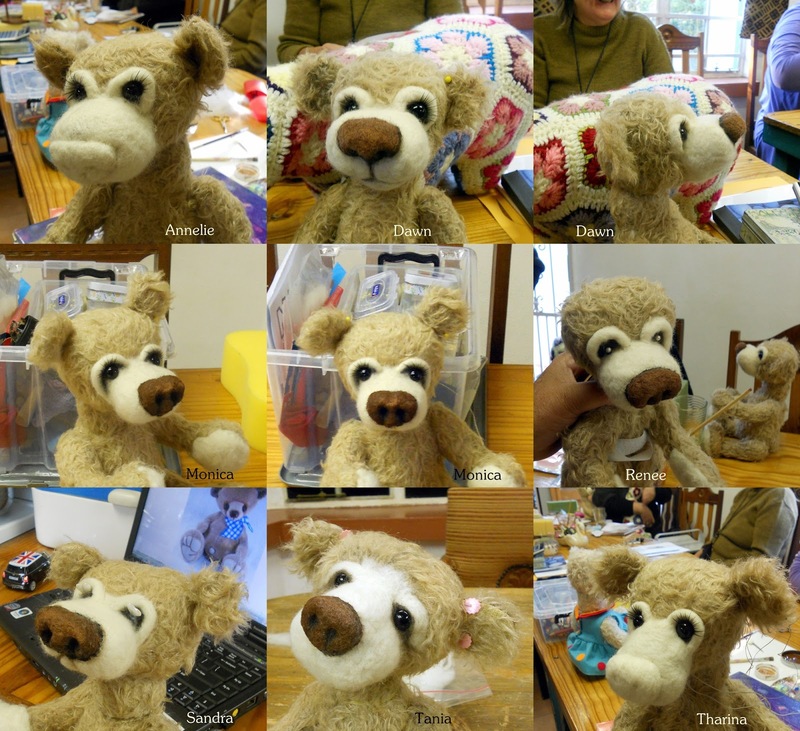 Here are a few photos of bears made at the sneak preview workshop we had last weekend. Dates available - 13 July, 14 September. Duration - 9am till 4pm, at Tin Soldiers Studio in Irene Pretoria. Cost - R 470. This includes the kit and patterns, felting requirements, workshop notes, tuition, lunch and tea. Additional felting needles are available at R 18 each. This workshop requires pre-sewing. You need to get a kit from Megan when you book for the workshop and do the homework. Comprehensive homework instructions are included with the kit. The pattern and instructions for the dress is included with the kit, but does not form part of the workshop. Materials to make the dress is not included. You will need two 25cm x 25cm squares of felt in the base colour, and scraps for accessorizing. Also some small buttons and press studs. On the day of the workshop, please bring along the following: completed homework, super glue, a foam block, small flat paint brush for acrylic paint no 0 or 1, watercolour pencils black and burnt umber, general sewing supplies. If you do not have all of the above, or forget something, don't worry, you will be able to borrow from the studio stash. To book for the workshop, email Megan at megbear99@gmail.com. If I get a kit and do it here is St. Louis, MO could you walk me through the felting process. Do you skype? Or even if you do a detailed blog for the people that can not make it. Hang in there Jan, once I have taught a few workshops, I will have a very good idea what to put in the written instructions and you will be able to follow easily. I am taking hundreds of photos of the needle felt process. If you have trouble finding supplies in your area, I will be able to send you a kit. And yes, I do Skype. I'm not very good at it though, need to overcome my stage fright! I will let you know when I do an online workshop, probably towards the end of the year. I love this! I needle felt, but this is an entirely new venue. I would definitely take a class or purchase a tutorial. Thanks for being willing to share your talents. If you have needle felted before, this workshop will be a breeze. I am teaching two more workshops in my studio 14 Sept and 19 October. After that I will use the hundreds of photos and everything that I learned from observing my students, and turn Roz into an online workshop for those of you who are too far away to attend in person. Something to look forward to by Christmas!